Plastic surgeon Daniel Mills, MD partnered with our team at Rosemont Media to develop a new website for his practice’s Orange County med spa, Laguna Beach Rejuvenation & Wellness. Outfitted with a responsive design, the site’s layout automatically adjusts to fit the exact screen dimensions of any desktop computer, laptop, tablet, or smartphone from which it is being accessed. In addition to its responsive capabilities, Dr. Mills’ customized website is equipped with an array of other dynamic design features, including fixed background scrolling on the homepage and a unique “flat” design implemented throughout the entirety of the site. The former of these innovative elements enables text and imagery located in the foreground of the homepage to move vertically across various stationary backgrounds as the visitor scrolls up and down. In contrast to a more glossy, multi-dimensional look, the latter design component makes key features of the website pop while also helping to improve the site’s performance across all Internet-compatible devices. In lieu of stock images, all photos used on the homepage and headers of internal pages are of Dr. Mills’ actual patients to help showcase potential results. Furthermore, convenient access to the med spa’s blog, specials, contact information, and even Dr. Mills’ plastic surgery website are located in the sidebar menu and footer of every page. Aside from the visual aspects, Dr. Mills’ new site is also optimized with the latest medical SEO strategies to increase its ranking and visibility when people search for injectables and dermal fillers, skin tightening treatments, skin care products, and various other key terms. 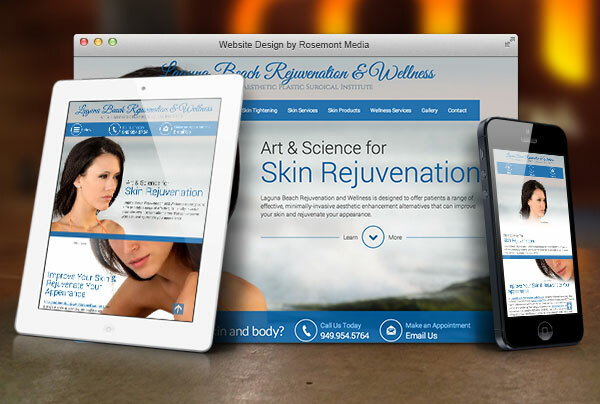 If you would like to check out the type of custom website Rosemont Media can design for your practice, feel free to visit www.lagunabeachrejuvenation.com.